248 pages | 10 B/W Illus. Most clinical psychologists and cognitive behaviour therapists adopt a perspective which assumes that a client's distress arises from inaccurate perceptions of the external world and that these perceptions are due to the problematic filtering of information about the external world through internal perceptual biases and schemas. 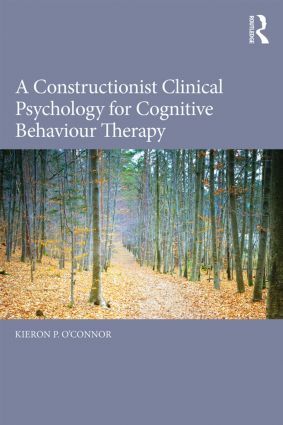 A Constructionist Clinical Psychology for Cognitive Behavioural Therapy provides a timely and innovative critique of the dominant trends in CBT theory and practice. It applies a constructionist framework to treatment and offers a constructionist philosophy and methodology to complement existing clinical approaches in cognitive behaviour therapy. Kieron O'Connor presents a much needed alternative constructionist framework (addressing both individual and social constructionist ideas) which is laid out in a clear fashion for the clinician. He shows how the framework can be integrated into practice and offers an alternative to viewing psychopathology as an isolated problem which focuses on pathology as a response to internal or external events. He reveals how the new constructionist framework can encourage clinicians to look at the client centred context which creates psychopathology and explore areas and experiences not easily accessible to traditional cognitive behaviour approaches, but which are rendered understandable through a constructionist approach to experience. "This is a very interesting and original book that looks at many issues in clinical psychology and CBT, and rethinks these using both phenomenology and constructionist ideas. For many years O’Connor and his associates have been writing some of the most original articles and books on OCD and anxiety: in particular they have looked at how narratives of doubt can unpick everyday certainties, and how the themes of OCD often relate to fundamental concerns of the person. Here they extent such ideas suggesting that pathologies arise out of history, context, imagination, and that, in general, experience is constructed in a multitude of contexts and processes. Following phenomenology, they take it as assumed that human life and consciousness is characterized by meaning and intentionality. Why Phenomenology? Constructionist Evaluation: Part One. Constructionist Evaluation: Part Two. Lived-in Imaginations. Dissociative States. Narrative Construction. Deconstructing Anxiety/Distress. The Body as Construct. Constructionist Approach to Clinical Psychology Research. Teaching Phenomenology. Kieron O’Connor is Director of the obsessive-compulsive disorder (OCD) Spectrum Study Centre in Montreal at the University Institute of Mental Health at Montreal, and Full Professor at the Department of Psychiatry, University of Montreal, Canada. He is an associate fellow of the BPS and fellow of the Canadian Psychological Association. He is author or co-author of over 200 publications and 12 books.